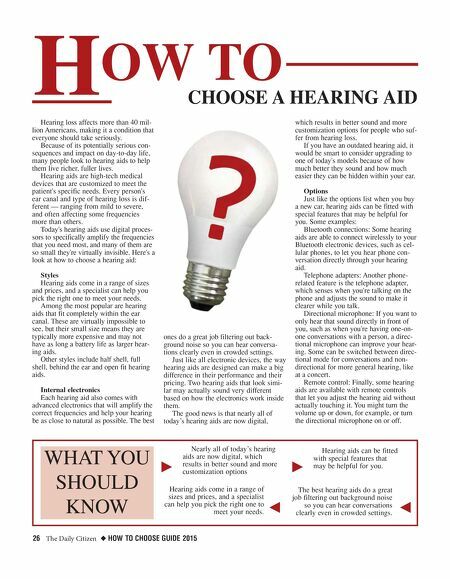 26 The Daily Citizen ◆ HOW TO CHOOSE GUIDE 2015 H OW TO CHOOSE A HEARING AID WHAT YOU SHOULD KNOW k j Nearly all of today's hearing aids are now digital, which results in better sound and more customization options Hearing aids come in a range of sizes and prices, and a specialist can help you pick the right one to meet your needs. k j Hearing aids can be fitted with special features that may be helpful for you. The best hearing aids do a great job filtering out background noise so you can hear conversations clearly even in crowded settings. Hearing loss affects more than 40 mil- lion Americans, making it a condition that everyone should take seriously. Because of its potentially serious con- sequences and impact on day-to-day life, many people look to hearing aids to help them live richer, fuller lives. Hearing aids are high-tech medical devices that are customized to meet the patient's specific needs. Every person's ear canal and type of hearing loss is dif- ferent — ranging from mild to severe, and often affecting some frequencies more than others. Today's hearing aids use digital proces- sors to specifically amplify the frequencies that you need most, and many of them are so small they're virtually invisible. Here's a look at how to choose a hearing aid: Styles Hearing aids come in a range of sizes and prices, and a specialist can help you pick the right one to meet your needs. 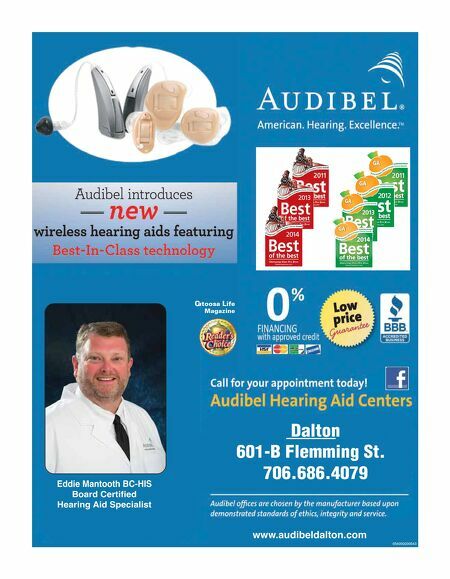 Among the most popular are hearing aids that fit completely within the ear canal. These are virtually impossible to see, but their small size means they are typically more expensive and may not have as long a battery life as larger hear- ing aids. Other styles include half shell, full shell, behind the ear and open fit hearing aids. Internal electronics Each hearing aid also comes with advanced electronics that will amplify the correct frequencies and help your hearing be as close to natural as possible. The best ones do a great job filtering out back- ground noise so you can hear conversa- tions clearly even in crowded settings. Just like all electronic devices, the way hearing aids are designed can make a big difference in their performance and their pricing. Two hearing aids that look simi- lar may actually sound very different based on how the electronics work inside them. The good news is that nearly all of today's hearing aids are now digital, which results in better sound and more customization options for people who suf- fer from hearing loss. If you have an outdated hearing aid, it would be smart to consider upgrading to one of today's models because of how much better they sound and how much easier they can be hidden within your ear. Options Just like the options list when you buy a new car, hearing aids can be fitted with special features that may be helpful for you. Some examples: Bluetooth connections: Some hearing aids are able to connect wirelessly to your Bluetooth electronic devices, such as cel- lular phones, to let you hear phone con- versation directly through your hearing aid. Telephone adapters: Another phone- related feature is the telephone adapter, which senses when you're talking on the phone and adjusts the sound to make it clearer while you talk. Directional microphone: If you want to only hear that sound directly in front of you, such as when you're having one-on- one conversations with a person, a direc- tional microphone can improve your hear- ing. Some can be switched between direc- tional mode for conversations and non- directional for more general hearing, like at a concert. Remote control: Finally, some hearing aids are available with remote controls that let you adjust the hearing aid without actually touching it. You might turn the volume up or down, for example, or turn the directional microphone on or off.